What is Herbal Thai Massage? An ancient healing art from the rich spiritual traditions of Thailand, this unique form of bodywork blends massage, Thai energy meridian therapy, acupressure and passive yoga-like stretching to align, balance, relax and revitalize the natural energies of the body. The assisted stretching of Thai massage can be described as a "one-way partner yoga," and thus Thai bodywork is also fondly known as "Lazy Man's Yoga," since for you the session is completely passive, while the practitioner does all of the work. Your only duties are to breathe, be aware, and do nothing. During a general wellness-oriented treatment, the therapist guides your body from one position to the next, they support your body in each pose while using massage to relax muscles and open joints, soothing aches and pains. Massage and Movement fluidly blend together, imparting a rhythm that gently rocks the body to soothe the mind from stress and fatigue. 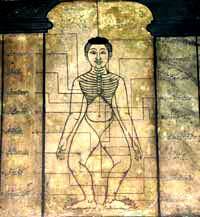 The massage of traditional Thailand is considered a medical art, applied to a system of energy meridians called "sen". Thai traditions teach that there are an infinite number of connections in the body, arranged into lines of influence. The Thais consider ten of these lines to be the largest channels from which all others branch, and it is these ten primary "sen" that are treated in Thai massage. In a general treatment for wellness, all of the sen are worked equally to cultivate and promote even energy flow. The more specific therapeutic use of the lines involves additional treatment on one or more sen. The nature of the illness or condition determines what sen are treated, as they are all associated with having specific effects on the physical, mental and emotional selves. Acupressure is a healing technique that stimulates muscle points and nerves using direct finger pressure along the surface of muscles and bones. This stimulation sends signals up and down the length of the nerve from that point, stimulating muscles, organs and other structures that it encounters along the way. Though a limited example, the physician's reflex test somewhat illustrates this. The kick that follows the mallet hitting your knee is a reflexive response, and it is through these kinds of responses that acupressurists stimulate the body to heal itself. However, instead of striking these points to get a "knee-jerk" reaction, practitioners use sustained pressure to stimulate them. Thai massage starts slowly, with basic positions and stretching to loosen muscles and release restricted energy. Gradually your muscles soften and lengthen, increasing your flexibility and ability to move freely. With every session we evaluate where you are to work within your limits, and with regular treatments deeper stretching can be used to realize your full potential. The advanced positions of Thai massage, while visually exciting, can also be a bit intimidating to newcomers and are usually unnecessary in practice. We find that applying basic stretches while paying close attention to their detail is just as effective if not more so, and only a handful of the clients here receive advanced stretching. Most advanced positions are for those whose flexibility extend beyond the basics, and though we want you to experience the advanced postures of Thai massage, we also know it's not to be rushed. As there are many styles of music and dance, there are also different styles of Thai massage. Southern Style Thai tends to be harder, faster and generally more aggressive, while the Northern Style is slower and much more meditative. We are of the Northern lineage, and prefer to bring an element of serenity and stillness to our treatments, especially since most of our clients move too fast on a daily basis already. However, for those who crave intense deep tissue work, the owner will happily use the Southern Style upon request. In short, please don't be too hesitant. The only way to know if you'll enjoy Thai massage is to try it, and you may have to see different practitioners to find one you like. Though we will push your limits little by little (because that's how progress is made), we love and are very proud of what we do, and we want our sessions with you to be as enjoyable and uplifting as they are beneficial. Thai massage is very effective in relieving a wide range of conditions including headaches, migraines, arthritis, whiplash pain, paralysis, numbness, sciatica, back pain, scoliosis and fibromyalgia. No two people respond to any stimulus in precisely the same way, so people will vary in their response to Thai Massage. A person who is relaxed, open to growth and new experience, will benefit the most. One who is more tense, rigid, or fearful, will benefit, but will need more time. Some will find that a single treatment can radically alter their perception of their own body, and therefore their sense of self, while others will require a longer time to achieve the same result. Regardless of the speed of one's progress with Thai massage, every session is sure to be enlivening! For those who are too sensitive for stretching or acupressure, the Thai Herbal Massage is an alternative, using hot herbal compresses to stimulate the energy lines and points, while the herbs themselves also provide medicinal benefits. Relief from muscle soreness, tension and inflammation are just a few of the benefits of adding herbs to a Thai massage. Herbal compresses are typically combined with traditional Thai massage for the many benefits the herbal heat and oils offer the body. Many of the herbs are also common to Thai cuisine, such as kaffir limes leaves, lemongrass and galangal root, used widely for their flavors and aromas! They contain many natural medicines that help to relieve inflammation, tone the internal organs, improve circulation and digestion, and well as toning and rejuvenating the skin. Inhaling the steamed essential oils from a compress on your chest or under your neck is a wonderful way to clear sinuses and airways, and is natural aromatherapy for soothing anxiety, depression and other mental and emotional stress! With luxurious oils the traditional herbal therapy is transformed into a blissful spa experience, using the herbal compresses much like hot stones, plus the benefits of aromatherapy oils and medicinal essentials steamed right from their natural source! These rich medicinal herbs are blended, wrapped and tied to make firm, fragrant bundles. The bundles are steamed hot, slowly releasing their revitalizing and healing essential oils, then pressed against the body during massage. Moist heat radiates down through the tissues, melting tension and soreness away. Steam opens the pores and the skin breathes, drinking in the rejuvenating, enriching herbal oil blend while soothing, uplifting aromas open the senses and relax the mind. This one of the most natural aromatherapy spa treatments available, a truly unique experience! For some chronic conditions, even the lightest pressure or stretching can be too much! Fibromyalgia is one of the best examples, a condition where muscles are unable to completely relax on their own. The constant muscle tension may result in an ultra-sensitivity to pressure where even the weight of clothing or a gentle finger stroke across the skin can be very uncomfortable or painful. Herbal compresses can be used to soothe these overworked and sensitive areas of the body, stimulating nerves and muscles that cannot be massaged directly. After a few sessions the body can tolerate more stretching and massage, allowing the practitioner to open the body further with each session, and eventually the pain and discomfort may subside altogether. Similar results are possible when treating many other conditions, such as multiple sclerosis and osteo arthritis. The compresses used in Thailand can have any number of herbs in endless combinations, using everything from fresh leaves and flowers to fruits and earthy roots! The herbs are blended according to what the treatment needs, and sometimes more than one kind of compress is used. Sabai's compresses are fashioned using a traditional recipe from Northern Thailand for overall balance and a boost for the body, energy and mind! The contents may vary slightly, but listed below are a few of the most important ingredients. Popular for its enlivening scent, the aroma has an emotionally refreshing effect. Its powerful antiseptic properties kill germs and speed the healing of wounds and infections, while inhaling the steamed vapors or applying eucalyptus to the chest and throat are all effective treatments for colds, cough, congestion, asthma and other respiratory conditions. This grass-like herb has a sharp, fresh, lemony aroma, making it a favorite additive in food, drinks and cosmetics. It is used in steam baths and hot compresses for its soothing yet invigorating properties, clearing the head and uplifting the mind. As a hot tea, lemongrass is a powerful remedy for soothing headaches and hangovers. Called khamin in Thai, turmeric is one of the key ingredients in healing concoctions. It is used internally to treat all manner of circulatory and digestive problems. It is also an efficient natural moisturizer and antiseptic, making it a popular ingredient in a wide variety of spa skin treatments. While sharing many of the benefits Ginger offers, Galangal is often called Thai ginger but is not a ginger at all. Taken internally this root relieves many digestive ailments, while applied to the skin it is a strong antiseptic, generally tonifying it and treating skin diseases, and is often found in the spa as an ingredient in herbal body wraps. The leaves of the kaffir lime tree have the invigorating citrus smell of the fruit itself, and while used in Thai cuisine to add the tangy flavor to soups and curries, when someone rips a leaf to pieces you'll want to just stand there and breathe it in. The vapors are not only uplifting, but treat respiratory ailments as well, while the oils on the skin act as a cleansing astringent. Ginger is one of the most important herbs in Thai healing, and is known as a powerful stimulant that hasa heating effect on the body. While most of this herb's benefits come from its use in tea or cuisine, in hot compresses its oils boost circulation, ease muscle stiffness and, most importantly, increases the potency of all the herbs combined with it. A family relation of cinnamon and arguably one of the most important ingredients, camphor is extracted and processed from tree resin, leaving a minty white powder. Somewhat a paradox, camphor is both a stimulant and a calmative, stimulating the brain, heart and circulation while relieving mental and emotional stress, anxiety and insomnia. Like eucalyptus, camphor does wonders for the sinuses and respiration when steamed and inhaled in baths or saunas. Used in compresses it soothes sore muscles and arthritis, and is a powerful nervine to treat nervous system disorders such as multiple sclerosis and fibromyalgia.